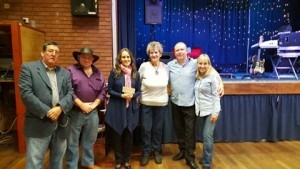 Richmond Country Music evenings held at The Hereford Richmond Place Club have been fundraising for Herefordshire Heartstart. Les Walker Secretary for the Hereford Richmond Place Club recently invited Loraine Coleman from Herefordshire Heartstart to the Richmond Country Music evening, to be presented with a cheque for the charity. A personal donation was also made by Sue Stoker in memory of the club’s Treasurer Tom Stoker. Loraine Coleman says “Thank you to everyone at the Richmond Place Club and to everyone who has supported the fundraising done at the Richmond Country Music Club evenings which raised £500 for Herefordshire Heartstart. Herefordshire Heartstart is a local voluntary organisation and registered charity, who deliver Heartstart how to save a life training in Herefordshire. We run courses across Herefordshire for various groups, other voluntary organisations, community groups, businesses and schools, as well as offering regular public courses. The charity also supports Schools in the area, with courses being delivered by The Schools Training Supervisor Loraine Coleman. Staff attend a full day’s instructor training and are then able to deliver the Heartstart skills to their pupils. The money raised will hugely benefit the Schools Heartstart training, which no longer receives any grant funding and now runs on the generosity of the public through donations and fundraising. This donation will enable us to continue delivering Heartstart training to schools staff, so that more children in Herefordshire can receive Heartstart how to save a life training. A Heartstart course teaches what to do if someone was unconscious, choking, bleeding seriously, having a heart attack, and how to perform CPR (cardiopulmonary resuscitation).